I have always had a difficult time writing in my books. So, I guess you can imagine when it comes to my Bible, that is a definite “no no.” Or, at least it was for a long time. For many years, my primary Bible remained clean (ex: no writing, no highlighting, no creased pages, etc.). It looked funny against the Bibles of others who had carefully taken notes, highlighted sections in multiple colors and dog-eared pages for easy access. If you really use your Bible as a study guide for life, it should not be clean. There should be a lot of notes and a variety of colors marking those important and favorite verses and passages you want to remember. A few dog-eared pages are also all right. Although you do not have to be an “artsy” kind of person to enjoy using the Bible Journal Kit, I did give the kit to my daughter. She has been spending more time in the Word (yippee- she also takes a lot of notes). If you have a child who needs encouragement (or even you) to spend more time reading God’s Word, having the Bible Journaling Kit will enhance your active investigation (learning more about God). With the Christmas season right now, the Bible Journaling Kit would make a nice gift for someone special. Hmm, Christmas gift? Anytime gift? Would you like a chance to win a Bible Journaling Kit? You have two different opportunities. It’s okay to write, draw and put stickers on your Bible pages. 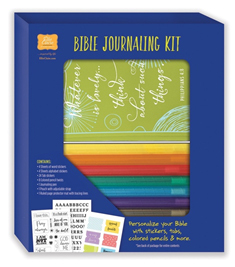 This Journaling Bible Kit encourages you to do that as you dig deeper into the Word. #1 Giveaway: Be one of five winners of the Bible Journaling Kit from through Thursday, December 15, from Ellie Claire/ Worthy Publishing. Enter now. #2 Giveaway: Homeschool Roster will open a giveaway on Monday, December 5, for you to win a copy of the Bible Journaling Kit. This giveaway is open to people in the continental U.S. only (No Canadian winners may be accepted).